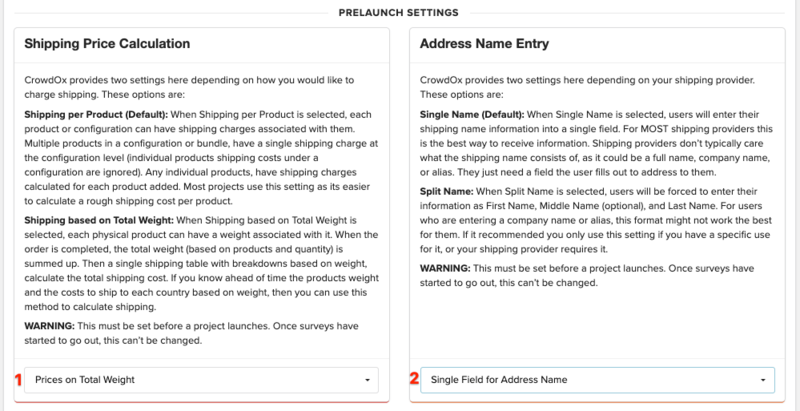 Within Project Settings you'll find many options to help tailor your project, such as how shipping is charged, required order information and backer change access. A brief description of each of the available project settings is found below, a more thorough description can be found on the Project Settings page. To Access Project Settings click on "Settings" from the left menu. 1. Enter Support Email: Enter your project's support email address. This is the email address in which our team and backers will be able to reach your team for help with all project and product questions. We handle the survey/tech related questions. 2. Enter Project Website: If available list your project's direct webpage here. 3. Add Twitter Handle: If available add your project's twitter handle here. 4. Add Google Analytics ID: If available add your project's Google Analytics ID here. 5. Unit of Mass: If using weight-based shipping, you can select the unit of mass you'd like the product weight to be listed as. 6. Unit of Length: You can add product dimensions to products (not visible to the backer but used for fulfillment) and dictate the unit of measurement used. 7. Currency: Your project will import with the currency used during your Kickstarter/Indiegogo campaign. Dictate the currency to use for the preorder/Crowd Ox source (if needed). 8. Currency Symbol: Identify the currency symbol to use for the preorder/Crowd Ox source (if needed). 9. Thumbnail Image: Imported projects will automatically use the Kickstarter or Indiegogo photo. Add a new project image that will display when you initially log in and select your project. Once the project surveys have launched these settings will be locked and cannot be changed. Please be sure to review these settings and set them accordingly prior to launch. 1. Shipping Price Calculation: If you will be charging shipping during the survey, for reward levels or products added on as an extra, you'll need to determine how you want the shipping to be charged. From the drop-down at the bottom select either "Prices per Product" or "Prices on Total Weight". Selecting "Prices per Product" will allow you to assign shipping by product, click here for help. Selecting "Prices on Total Weight" will allow you to assign each product a weight and shipping will be charged based on the total order weight. Click here for help with weight based shipping. 2. Address Name Entry: Your fulfillment vendor may require that the backer's name be formatted in a specific way. To determine how the name field is separated, select "Single Field for Address Name" or "Multiple Field for Address Name". "Single Field for Address Name" is most commonly used and will put the backers entire listed name in one box. Multiple fields is often only needed when required by your fulfillment team. Using "Multiple Field for Address Name" will allow you to split the First Name, Middle Name/Initial, Last Name into separate fields. The following settings can be enabled at any time by toggling the switch to the right position, turning the toggle green. 1. Close Completed Surveys: Enabling will prevent backers from reopening their survey to make changes to their pledge after they've completed their survey. Backers can update their address from their confirmation page unless the "Don't Allow Shiping Address to be Updated" setting is enabled. 2. Don't Allow Shipping Address to be Updated: Once enabled backers will not be able to change their shipping address from the confirmation page, after the survey has been completed. Backers can reopen their survey and change their address unless the "Close Completed Surveys" setting is enabled. 3. Enable Company Name on Shipping Address: When enabled an additional field will appear in the shipping address portion of the survey allowing backers to list a company name. This will be an optional field for backers to use. 4. Enable Split Export SKU: If this is enabled, when generating an export, any product sku that has semicolons in it, will split and generate a row for each semicolon in the sku. Please note this will copy the data across each of the split rows (quantity, prices, etc). Please use with caution. 5. Require Phone Number for Domestic Shipping Addresses: When disabled this setting will default to requiring a phone number only on international orders. When enabled this setting will require a phone number on domestic orders as well. 6. Show Product Description when Configuring Products: If this is enabled it will display the product description again to help when configuring the reward, manual or external products. 7. Show Support Email to Users: Enabling will display your actual project support email (as entered in the project settings above) to backers during the survey and in their confirmation email. Traditionally our assigned project email address will display and the emails will forward to your support team through our email address. This setting gives backers access to your direct support email address.